This review first appeared in the November 21, 1984 issue of The Daily Aztec. If it only seems as if the Staples Singers have been around forever, Roebuck "Pops" Staples and his daughters are certainly among the elder voices of the populist wing of black gospel. But even given their reputation for staying up to date, the funky, energetic music found on their latest album manages to surprise. Still, the Staples are a gospel combo, and their message of Christianity as the path to salvation has not changed, even if their styles have. "H-A-T-E (Don't Live Here Anymore)" is a theme song similar to "Bridges." 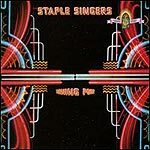 Here, Pops Staples' gives a strong, controlled performance on lead vocal. The most commercial song is "This Is Our Night," an extremely danceable funk number that hearkens to the band's breakthrough 1970s' sessions on Stax Records  although without any higher message. Mavis Staples takes over with her deep, husky voice, and the melody is catchy. The biggest surprise on this surprising album is a cover of the Talking Heads' "Slippery People," with Talking Heads leader/songwriter David Byrne sitting in on guitar. The Staples manage to take this song even more uptempo and dance-ready than the original; it is a powerful performance.